When I was a young piano player in Los Angeles, I used to love to go to a jazz club out on the Sunset Strip in Hollywood known as "The Bit." It was a tiny little place -- I doubt if it seated more than 50 people -- yet it was THE place for jazz fans (such as Wilt "The Stilt" Chamberlain, who frequented the place and seated himself in the tiny venue by throwing one leg completely over a table!) to hang out and see the great jazz artists of that era. I vividly recall sitting at a little table with Bev, my new bride, and chatting with Anita O'Day and Helen Forrest, two great female jazz singers. I was a fan of Anita at the time, but I didn't know who Helen was (I was a bit too young). Later, I found out that she sang with several of the big bands of the 1940's including Benny Goodman and Harry James and appeared with Bob Hope and company as they entertained the troops during WW II. I was taking piano lessons back then from THE piano teacher in Hollywood -- Dave R...., who had a little studio on Cahuenga Blvd, which was between Hollywood Blvd and Sunset. All the big names of that era took lessons from Dave, and I would meet them as I was coming or leaving Dave's studio. followed by the I chord. Let's spell it out to make it clear. Pretend you're in the Key of C. The I chord is C -- correct? And the IV chord is F -- correct? Now -- what chord is a perfect 4th higher than F? Just count up the F scale 4 notes - F, G, A, Bb. So the answer is Bb. That's the IV of the IV chord. 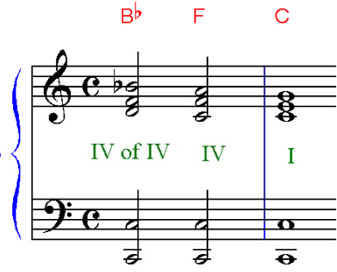 So the progression in the Key of C would be: Bb to F to C.
But here's the key to giving it a "gospel sound" -- use the 1st inversion of the first chord (the IV chord of the IV chord), the 2nd inversion of the 2nd chord (the IV chord), and the root position of the last chord (I). You can either use the root of each chord as your left hand low note, or you can use the root of the I chord as an ostinato (constant low note). It's also fine to embed a 7th in any or all of the chords -- the "bluesier" the better! Next time we will demonstrate another gospel technique, which builds on this technique, but turns it into a rock or jazz riff.